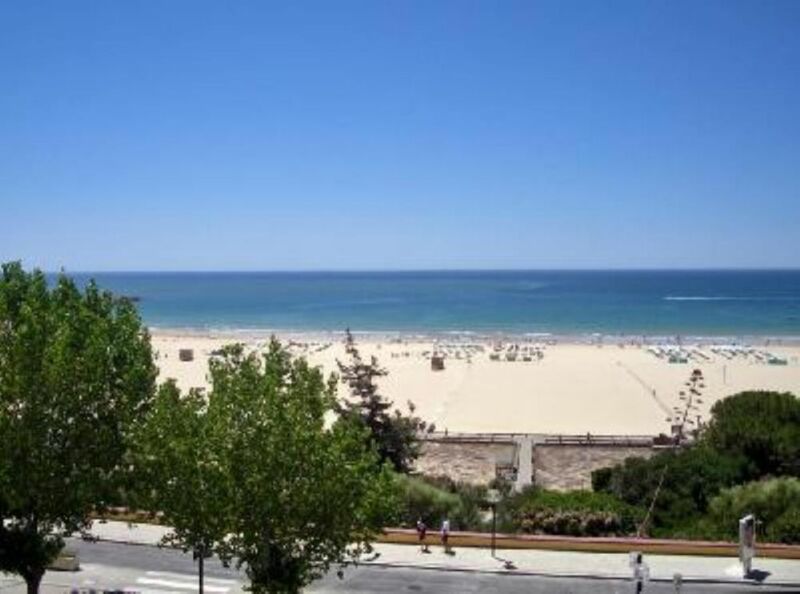 (Text automatically translated) Praia da Rocha - Portimão - ALGARVE - PORTUGAL 2 BEDROOM APARTMENT WITH TWO LARGE TERRACES FULLY REFURBISHED IN 2008. IS THE SECOND FLOOR OF A DWELLING OF MODERNIST ARCHITECTURE OF 40 YEARS LOCATED ON THE FIRST LINE, VIEW OF THE SEA AND BEACH. LOCATED IN POSH AREA OF ROCK NEAR THE BEACH MARINA WHERE COULD USE A SALT WATER POOL THE PRICE OF 5 ? PER PERSON. Beach with direct access to 20 m. Marina 200m. A 1 km from Portimão and 70km from Faro Airport. Bus stop to Portimão 50m. We stayed at the apartment for2 weeks. The apartment was very clean with everything you need was supplied . We really enjoyed being able to have breakfast with a view every morning. Communication with the owner and the local contact Francisco was excellent. Towels were changed regularly and apartment was also cleaned.We would definitely recommend this apartment and will use again if we return to the area. Only thing I would recommend W would be some seating in the second balcony. Thank you for the information you have posted on the Homelidays website about the Villa Mirante. You are a very nice family, I hope you come back always. You're right, the terrace of the suite should be more cozy and have some seating, let's think about it. For the next you will have this surprise. We stayed for 1 week and really enjoyed our stay in this comfortable, bright apartment. The views from the apartment were great, the weather wasn't wonderful, bit cool, but we could watch the activities on the beach from the balcony or living room. Short walk to restaurants, great little cafe for breakfast next door. There are a number of steps up to the apartment but it is well worth the effort. Steps down to the beach directly opposite the gate. Would definitely go back to same property. Owner very good to deal with. No problems. Very relaxing holiday. Everything about this villa was perfect from start to finish. It certainly has a wow factor when you arrive. It’s so beautifully furnished and comfortable. The views are superb and the balconies are so relaxing to ‘watch the world’ go by. Although it’s in quite a central location, it is a very peaceful property. Every night we listened to the sound of the sea to lull us to sleep. The villa is located right across from the beach and there are plenty of restaurants, bars and cafes to choose from. Maria was there to greet us upon arrival and the whole booking process with Teresa was easy. Definitely a special place and one we would like to revisit. You are a very nice couple and I thank you immensely for the beautiful words they have told us as well as the reference to me and Maria. We are very pleased to wish to return. We are waiting for you with the usual sympathy. This is our second visit to Praia da Rocha, and we couldn't have picked a better place to spend our time. The views over the beach are fantastic, the apartment itself is great with two bedrooms (one en-suite) and further beds available on a sofa bed or fold out bed, which suited our family of 5. The apartment has everything you need including a washing machine, dishwasher, coffee machine.....the list goes on. A short walk along the main street gets you to all the main shops and restaurants, but you're just far enough away that its peaceful and quite if you want to just relax on the balconies and watch the world go by. If the owners are around when you visit then they are really nice, and Maria the housekeeper will help you out with anything you need. In our opinion, a perfect place to stay. A wonderfull family. I really hope to see them soon. First of all both the owner of this property and Maria(who you will probably meet should you book) are both really helpful and will do whatever they can to make your stay as pleasant as possible. The location is perfect as it's just out of the main town however this can easily accessed in less than 5 mins of walking. To give you an idea I walked from the apartment right to the other end of town (for some AMAZING sushi) within 15 mins. The view from the apartment is stunning as you have a completely obscured views of the beautiful beach right out to sea. We had a family holiday with a 2 year old so didn't make full use of all the bars and restaurants but there is plenty to do locally as well as a good variety of attractions within easy driving distances i.e. zoos and water-parks. This is one of our favorite holiday destinations, as its within driving distance to where we live, so we will definitely be back. I just thereby, thanked the expressions of sympathy that you have done on our apartment on the Homelidays website. We were very impressed with this beautiful apartment. All fittings are high quality & tasteful. Large living room with very comfortable large corner sofa & spectacular views opening onto large terrace. Beautiful big double bedroom with en-suite plus a pretty double bedroom again with en-suite. Right next to the beach at the quieter end of Praia but all shops & restaurants within 5 mins walk. Lovely - we couldn't fault it! Hello, I just thereby, thanked the expressions of sympathy that you have done on our apartment on the Homelidays website. Testimonials are very important for future customers. A good return to work. Until the next opportunity, you guys are always welcome. (Text automatically translated) Take the motorway A2 (Lisbon Algarve) Exit in Portimão, follow towards Praia da Rocha - Casino and Fortaleza, passing in front of the Hotel Algarve Casino, a little later will the Oriental Hotel, walk a little more, when construction does not already exist on your right, look left and you will see the Villa Belvedere.